Just some eggs from my colony. I am taking some "eye candy" shots for a presentation and thought these looked kind of cool. The rafts stick to one another with via van der Waals forces, I believe. Makes for some pretty patterns. Also note that sometimes females die in the process of ovipostion, especially in a dense colony situation. How many eggs do you think we're looking at? Is each cluster from a different female? My skin's crawling just looking at this! Very impressive. Yes, each of the rafts is from a separate female. 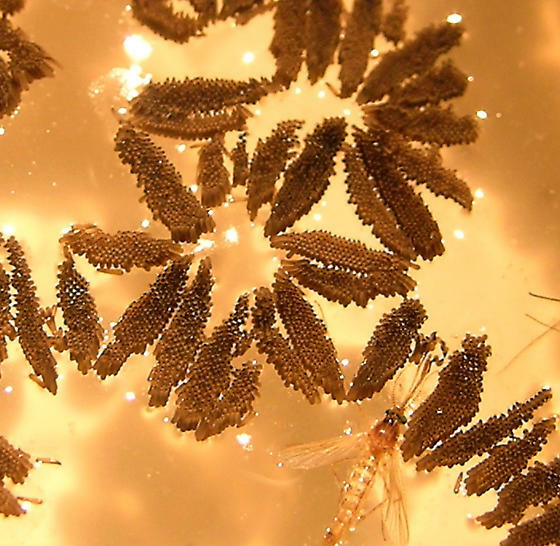 In a recent experiment, with 71 mosquitoes fed identically to the ones who laid these eggs, the average number of eggs/raft was 163. The average hatch rate was 85%, taking into account rafts that were almost entirely sterile. The 71 egg rafts in my experiment produced 9,973 viable larvae. So if you assume that the average size of egg rafts holds, with the same hatch rate, and you count 25 rafts in the picture, these eggs would produce 3463 1st instar larvae. Reminds me of a kaleidoscope.